It was a dark day in a Dallas Federal Court room Tuesday as Sandy Jenkins of Dallas based Collin Street Bakery plead guilty to conspiracy to commit money laundering, mail fraud, and making a false statement to a financial institution. Far from a modest and secreted scheme, sixty five year old Jenkins allegedly engaged in a nine year scheme that included over two hundred private airline flights, lavish homes, and a vacation home. 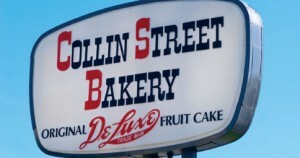 Collin Street Bakery is famous for its cakes and confections, their fruit cakes being distributed around holiday time and distributed nationwide. This is yet another example of the entitlement culture that has taken over large corporations. Working hard for your brand, fighting and vying for superiority in your industry is fine, hell, its American. But a perversion has developed as we see the growing and growing disparity between the corporate elite and their workers – for some of them, why make more money when you can steal it? I could name off dozens of corporate executives that have either bilked their investors out of money, misappropriated funds, or flat out stolen cash outright from their companies. Very seldom do they engage in these schemes as a way to cheat to get ahead in their business, if that did it for that reason there is an argument to be made that it could be forgivable. No, they did it so they could have 5 Bentley’s instead of one. They stole the money so they could take private jets to Tahiti every weekend for a month, instead of just for Christmas vacation. It will be interesting to see how this turns out. But as I have observed, it seems like those that steal with a pen rather than with a firearm seem to do alright – and I highly doubt that he will spend his last days on this earth in prison.